Seattle Opera’s rehearsal space will be the site of “The Combat,” a production designed to stimulate discussion. The immersive production is based on works from hundreds of years ago depicting love between a Christian man and a Muslim woman during the First Crusade. 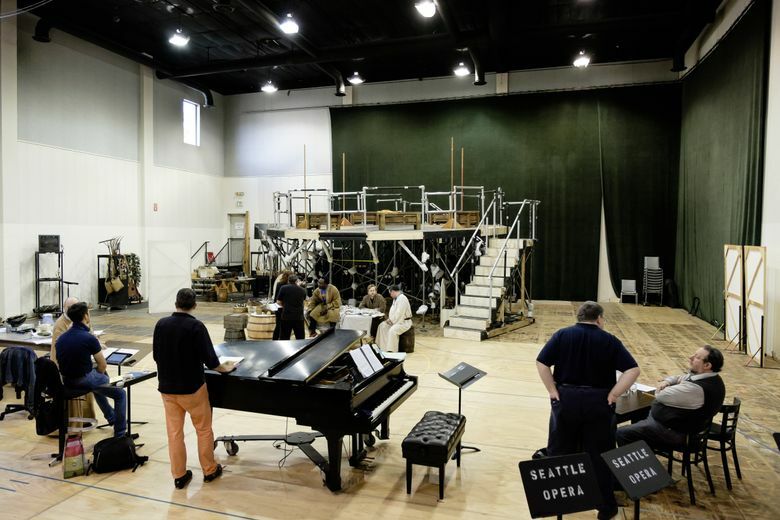 “The Combat” will be staged in Seattle Opera’s studio. Giving lie to the notion that opera has lost its relevance, Seattle Opera is unveiling its second immersive theatrical experience, “The Combat,” a production with a distinctly contemporary message. An English-language Baroque pastiche, “The Combat” uses works by Claudio Monteverdi, among others, to explore a relationship between a Christian man and a Muslim woman. Monteverdi’s short dramatic scene, “Il Combattimento di Tancredi e Clorinda” (“The Combat of Tancredi and Clorinda”), whose musical and emotional language was revolutionary when it first premiered in 1624, is based on “Jerusalem Delivered,” a 16th-century poem by Torquato Tasso that depicts a battle between two helmeted warriors: a male Christian crusader and a Muslim Arab woman. It is only when the male warrior removes his slain antagonist’s helmet that he discovers that he has killed the woman he loves. Monteverdi’s use of three different voices and especially piquant harmonies renders the tale heartbreaking. April 1, 2, 6, 7 and 9, Seattle Opera rehearsal studios, 200 Terry Ave. N., Seattle; $40 (206-389-7676 or seattleopera.org). Barbara Lynne Jamison, Seattle Opera’s director of education and community engagement, came up with the idea to flesh out the 17-minute Monteverdi with other works of the period, including sections from Francois Couperin’s gorgeous masterpiece “Leçons de ténèbres” (“Lessons of Darkness”) that talk about the destruction of Jerusalem. Her intention was to examine the three Abrahamic religions, Christianity, Judaism and Islam, and the irony of how far some believers have strayed from the faiths’ core message. Jamison’s hope, as with the company’s transgender-themed opera, “As One,” is to explore the deep emotions that opera can evoke, and stimulate dialogue about contemporary issues. To foster an intimate experience, the performance will take place not from the safe distance of the McCaw Hall proscenium, but in the Seattle Opera rehearsal studios. Although a limited number of seats will be available, attendees are encouraged to stand for the 50-minute performance. For “Combat,” Jamison has collaborated with two experts in their fields. Stephen Stubbs, founder of Pacific MusicWorks in Seattle and who is artistic director of the Boston Early Music Festival, will conduct an early-music ensemble and singers Eric Neuville, Thomas Segen and Tess Altiveros. “I much prefer working with pieces that have a difficult subject matter, and digging into the social issues of pieces that have been written hundreds of years ago,” he said. Jason Victor Serinus writes about classical music and high-end audio for publications worldwide. Reach him at jvserinus@gmail.com.